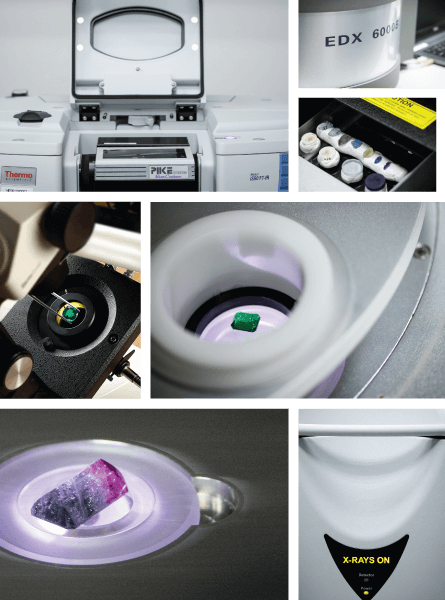 ICA | GemLab utilizes a wide range of equipments to perform the most modern and advanced techniques for identifying, analyzing, and geographically tracing the origins of colored gemstones. We have multiple tools to serve similar purposes in unique ways, equipping our team of experts with the ability to provide the most accurate, detailed, and customized reports for your specific needs, while still complying with the rules and guidelines of the industry. As one of the most advanced gemological laboratories in the world, ICA | GemLab has a host of technology that ensures that gem stone identification and testing process is of the highest standards. A combination of these advanced instruments along with the expertise that our team brings allow for the gem identification process to be accurate and ethical. The Laser Ablation Inductively Coupled Plasma Mass Spectrometer is our most advanced instrument. In addition to accurately placing the geographical origin of gemstones, this device can also test for beryllium and determine the presence of multiple elements. Beryllium is used to enhance gemstones such as sapphires, rubies, and emeralds, but cannot be detected by most machines. The Laser Ablation Inductively Coupled Plasma Mass Spectrometer ensures our customers are aware of any and all enhancements present in their stones, including beryllium enhancements. This instrument also excels at identifying the presence of macro, micro, and sub-micro elements, allowing for the most detailed of analysis. This machine enables us to differentiate between natural and synthetic gemstones, as well as analyze the elements of a stone to determine its geographical origin. The EDXRF also lets us test a gemstone for various enhancement methods. At ICA | GemLab, we have three different Energy Dispersive X-Ray Fluorescence Spectrometers which gives us the means to customize each user’s analysis for optimal results. The RAMAN gives our team the ability to identify gemstones. It is also an ideal tool for detecting and analyzing enhancements applied to specific gemstones, such as spinel. This instrument allows our experts to distinguish between natural and synthetic colored gemstones, such as rubies, emeralds, and sapphires. The device can then pinpoint the geographical origin of the stones. It can also test gemstones for common enhancements and modifications. The FTIR helps our experts distinguish between natural and synthetic colored gemstones, such as rubies, emeralds, and sapphires. The device can then pinpoint the geographical origin of the stones that do derive from nature. This instrument can also test gemstones for common enhancements and modifications.